Previously I wrote of Thomas Jefferson’s arrival back into this world and what he would think of where we are today. While I believe that would be an incredible learning experience for us all, Jefferson was a paradox when it came to slaves. The question that consumes me is what would Jefferson think about the the fight over slavery, its erasure, and where we are now with race relations? Jefferson was a walking contradiction when it came to slavery. In 1769 he proposed restrictive laws that prohibited slaves from entering or leaving Virginia. A few years later in 1778 in Virginia, Jefferson led the fight to ban the importation of slaves, expressing personal animosity against it. As a lawyer in 1770 and 1772, he represented several young mulatto males in their bid for freedom. In 1788 he wrote: “You know that nobody wishes more ardently to see an abolition not only of the trade but of the condition of slavery: and certainly nobody will be more willing to encounter every sacrifice for that object.” (Thomas Jefferson to Brissot de Warville, February 11, 1788.) Yet while he argued for gradual emancipation, he then opposed a law calling for the same in the Missouri Compromise, on the ground that the country wasn’t ready for it. As President, he argued against slavery, but he brought some of his slaves to the White House. 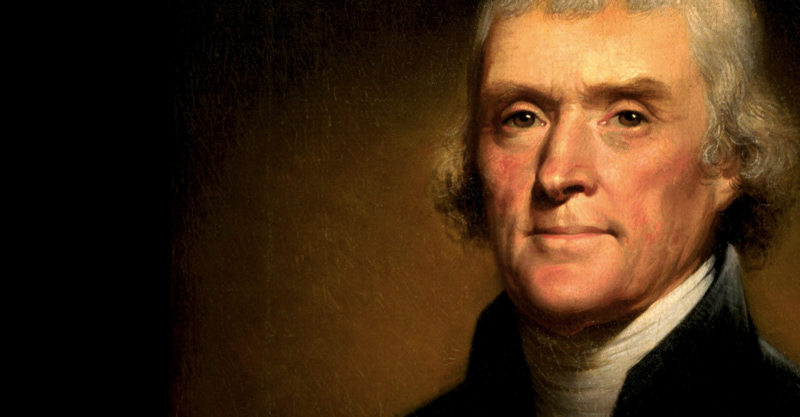 Jefferson denounced the international slave trade in 1806 and called on Congress, in what was essentially a “State Of The Union” speech, for a law to “withdraw the citizens of the United States from all further participation in those violations of human rights … which the morality, the reputation, and the best of our country have long been eager to proscribe.” The next Congress did just that, outlawing importing slaves. But the issue remained of what to do with the existing slaves. Jefferson wanted to expatriate them, either back to Africa or to a Caribbean island. So much for the land of the free and home of the brave. I’m not here to criticize him in his newfound resurrection, but how do you measure Jefferson today, with his varying views on slavery but his insightful brilliance on liberty? What would he think about race relations today? Would he be impressed with the progress that has been made, or depressed about the progress yet to be made. Would he appreciate that 360,000 Union soldiers, almost entirely white men, died fighting to abolish the practice? Would he be sad that 258,000 Confederate soldiers died thinking that keeping slavery was so important that a war had to be fought? As much as I’d love to have that conversation with him, I think it’d have to be done in hiding. One can see that the vitriol in our country is so great right now, especially about race, that it’s hard for people to be civil. I’d like to ask him about his paradoxical views on slavery, but my training as a lawyer allows me to sit in a room with a cold blooded killer and have a conversation. For many people, they can’t tolerate that someone has views contrary to theirs, especially on race relations, it would be too much I fear for many people to handle. The easy answer is for Jefferson to say that it was the times that he lived in. But it was not unusual for a Southerner to move to the North just to fight for the abolishment of slavery. Mary Ann and I had ancestors who did just that. Mostly these men were not wealthy landowners, yet they fought over that ideal of a free people. So no, Jefferson doesn’t get off the hook that easy. It was just as morally wrong to “own” a person then as it is now. So it’d be interesting to hear his explanation on both “all men are created equal” and yet on his death, he only freed 5 slaves and kept 130 to be sold to pay his debts. Before we talk about liberty, he’s got some explaining to do.